This Young Coconut Water by Wonderfarm in Malaysia sounded suitably weird when I bought it. 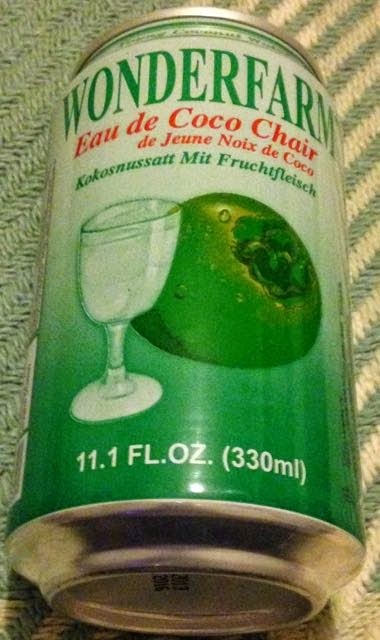 I've had some strange drinks before and I couldn't help wondering what the difference between young and old coconut juice was like. I've tasted chocolate and coconut milk, and also flavoured coconut juice before. Coconut juice straight with some pulp sounded like an odd, but refreshing change. On pouring from the can this was a clear almost transparent still juice drink with shredded pieces of young white coconut pulp floating around inside the glass. There was a light coconut smell to the drink, but nothing overpowering. It also had a light coconut taste to start with, no particular sweetness either, but the coconut flavour intensified moving into the aftertaste as I munched on the small pieces of white pulp. I wanted to be refreshed by this drink and I wasn't to be disappointed. I also wanted something different and was surprised at how subtle the drink was. It disappeared pretty quickly from the glass too, which is always a good sign, and then I almost lovingly chomped down the last few pieces of shredded young coconut pulp. 330ml can, per 100ml at 38 calories, with 0.1g of fat. Ingredients included; young coconut water, young coconut pulp, sugar, and potassium meta bisulphide 0.003%, preservative; Sulphur Dioxide.